A sober peek at what Australians are living with and how they are dealing with the oil and gas industry. SA has an opportunity to stop this in its tracks. Please share this with anyone that you know – especially farmers and land-owners in the Karoo. 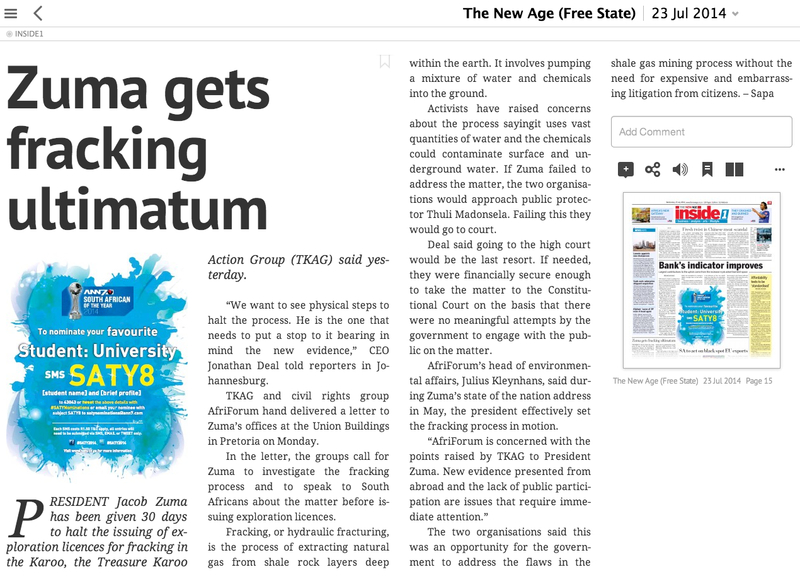 The call for a moratorium on fracking in SA has been picked up by the international press. Reuters, Bloomberg, Kuwait, Forbes and Petro Global News, amongst others, have picked up and reported on the story. Petro Global News We move markets. South African anti-fracking groups are threatening a preemptive injunction against exploratory drilling if the nation’s government does not place a moratorium on exploration licenses for the desert region of Karoo within 30 days, Reuters reported. Last year, Royal Dutch Shell applied for an exploration license covering more than 95,000 square kilometers (59,000 square miles), almost a quarter of the Karoo. The U.S. Energy Information Administration (EIA) estimates that South Africa has about 390 trillion cubic meters (13.77 trillion cubic feet) of technically recoverable reserves. Shell has three pending exploration license applications, and Falcon Oil and Gas Ltd. and Bundu Gas & Oil each have one, according to the EIA. In 2012, Chevron signed a five-year deal with Falcon Oil to explore the southern Karoo Basin. A NOVEL but functional alliance has arisen between AfriForum and the Treasure the Karoo Action Group (TKAG). The similarity in acronym with the better-known TAC (Treatment Action Campaign) grouping that succeeded in weaning the government off HIV/AIDS denialism and into the state supply of antiretroviral drugs to HIV-positive patients is not a coincidence. The TKAG is prepared, unlike many green-oriented organisations, to keep an open mind on difficult questions, and raise them pertinently and patiently with those in positions of authority with a view to getting accountable answers to legitimate queries. In alliance with AfriForum, it is here for the long haul. The TKAG was formed around concerns that fracking in the Karoo, in search of potentially valuable shale gas, could have environmentally disastrous effects, especially on the aquifer under the surface of the Karoo. It is worth noting in the context of the fracking debate that Total, the French oil company, has decided not to become involved in fracking at all at any time and in any location. This is a matter other oil companies ought to take into account and ponder carefully in their forward planning. There remain a number of candidates in the field in South Africa that are still keen to prospect for shale gas in the Karoo and, apparently, elsewhere. The government is actively encouraging this new energy source on the basis that it will create jobs, save foreign exchange and give a welcome boost to the economy. In successive state of the nation addresses, President Jacob Zuma has let it be known that shale gas exploitation is regarded as a “game-changer” by the government. Fortunately for those less than overwhelmed by the upside of fracking, the government cannot simply take a decision to proceed with fracking on its own whim. The fundamental and salutary difference between the old Ssouth Africa and the new South Africa is that politicians can no longer do as they please. Under the new dispensation, the activities of the executive and legislative spheres of the government are constrained by the constitution. The rule of law is regarded as supreme and any law or conduct that is inconsistent with the constitution is invalid. That is why the alliance between AfriForum and TKAG is so useful to the best interests of the country. The state must respect, protect, promote and fulfil the rights of everybody to an environment that is not harmful to health and wellbeing. This is guaranteed in the Bill of Rights. The provisions go on to specify that protection of the environment is for the benefit of present and future generations via the use of reasonable legislative and other measures designed to prevent pollution and environmental degradation. The securing of ecologically sustainable development and the use of natural resources while promoting justifiable economic and social development are the prescribed constraints on any government keen to embark on a new way of using natural resources such as the shale gas that may or may not be available under the surface of the Karoo in exploitable quantities extractable without environmental harm. 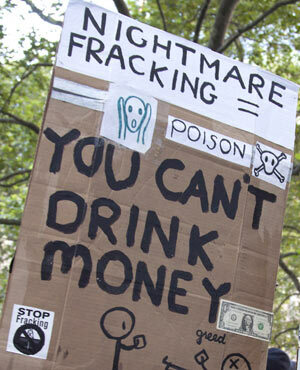 The question now is whether the state is observing the constraints upon it in its eagerness to get into fracking and the exploitation of the shale gas that may be found when the frackers explore for it. A new development in Canada, where fracking is not unknown, has thrown a major spanner in the works of those who wish to frack in South Africa. The Canadian government commissioned a comprehensive report on the ins and outs of fracking using the services of the brightest and best scientists at its disposal. The report, not to put too fine a point on it, is damning of the practice of fracking, its utility and its economic viability. This report has been presented to the South African authorities by AfriForum and TKAG. The authorities ignore its detailed contents at their peril — not only because of the environmental aspects of the Bill of Rights, but also because the constitution prescribes a high standard of professional ethics in the public administration. The wording of section 195(1)(e) is particularly applicable in the circumstances that have developed around fracking issues. The section prescribes, as values and principles according to which the public administration must be governed, that “people’s needs must be responded to, and the public must be encouraged to participate in policy making”. The next subsection emphasises the importance of accountability. Fracking has set off to a less than auspicious start when it comes to compliance with these requirements of our supreme law, which are ignored on pain of having conduct and laws struck down as invalid. A farcical public participation process in the Karoo, conducted exclusively in American English by foreign consultants in isolated areas in which the English language, as it is known in South Africa, is little understood and seldom spoken, was tried and then abandoned on the pretext that the remaining (majority of) people left out of the process would respond with equal incomprehension, disbelief and anger at the idea of the pillage of their heritage in the interests of making a quick buck on the proceeds of the sale of shale gas. The efforts at public participation of the commercial applicants chasing the necessary permission to prospect, were equally puny. One sporting outfit asked (this is what happens when one cuts and pastes) for permission to prospect in “the Greater Johannesburg area”. There is enough trouble there with acid mine drainage already, without further complications arising from the activities of those who seek permission to frack. The draft regulations on fracking have been subjected to scrutiny of about 600 pages by those concerned about the legality, constitutionality, sustainability and viability of engaging in an activity that could forever pollute the underground water of the Karoo, a special part of the family silver of the nation. The government has yet to respond to the matters raised in the objections to the draft regulations, which span a multitude of errors, omissions, ambiguities and contradictions. Any failure to deal responsively, openly and accountably with the objections lays the government open to a legal attack for want of compliance with the foundational values of our constitutional order. TKAG and AfriForum have let it be known that they will not be ignored. They suggest, wisely so, that the moratorium on exploration be reinstated and that, until the Canadian study is assessed fully against local conditions in SA, there be no “game-changing” plans made to get on with fracking in a situation in which angels would fear to tread. They have drawn the government’s attention to a congressionally mandated study in the US that is reaching finality after five years of intensive research, but has yet to be published. It is not too much to ask of our government to avoid rushing in for the sake of the agricultural and tourism activities in the affected areas. An ill-considered approach, such as the now rescinded acquisition of a 25% stake holding by the African National Congress in Hitachi Power Africa, is not indicated. The objectors have the clout, the wherewithal and the experience to ensure that if there is to be any fracking in SA, it will be done in a constitutionally compliant fashion. It may just be easier and better for all concerned to look more carefully at our plentiful clean and renewable sources of energy that remain unexploited, perhaps because they are clean in more than one sense. •Hoffman is a director of the Institute for Accountability in Southern Africa. Johannesburg – An anti-fracking group threatened a legal challenge on Tuesday to government plans to grant shale gas exploration licences in the pristine semi-desert of the Karoo, saying the regulatory process had been marked by “patent ineptitude”.In a February State of the Nation address, PresidentJacob Zuma described shale gas as a “game changer” for the economy and said Pretoria would allow hydraulic fracturing, or fracking, “within the framework of our good environmental laws”. The government had been expected to publish regulations overseeing shale exploration before an election in May this year although there is still no sign of the rules. Fracking involves digging wells up to 4 km deep and pumping in large amounts of water and chemicals under high pressure to crack the shale rock and release the gas. In a dry region such as the Karoo, in the middle of the country, any change in water use causes concern. Green groups wanting to protect the Karoo, believed to hold significant shale gas deposits, said Pretoria was incapable of ensuring firms such as Royal Dutch Shell, at the forefront of the fracking push, would adhere to the rules. They accused the energy companies of already drawing up slip-shod environmental plans and failing to consult communities and landowners, violating fundamental property rights. “The environmental management plans are fatally flawed,” Jonathan Deal, head of the Treasure the Karoo Action Group (TKAG), told a news conference. If the government failed to heed TKAG’s call for a moratorium on exploration licences within 30 days, the group would seek a pre-emptive injunction blocking them and was prepared to go to the Constitutional Court, he added. Deal declined to reveal TKAG’s backers although Cartier billionaire Johann Rupert, South Africa’s richest man and a major Karoo landowner, told Reuters last year he was prepared to fund a challenge as far as necessary. The Department of Mineral Resources did not comment. Shell said it was committed to following government regulations and listening to the views of Karoo residents. The first formal interest in shale gas in the Karoo began in 2008, with an application for exploration rights by Bundu Oil and Gas, a subsidiary of Australia’s Challenger Energy. The issue hit the headlines three years later, when Shell applied for an exploration licence covering more than 95,000 square km, almost a quarter of the Karoo. An outcry from farmers led to a moratorium on the granting of licences. The basis for Shell’s pro-fracking argument is a U.S. Energy Information Administration (EIA) assessment of 390 trillion cubic feet of technically recoverable reserves, about two-thirds of deposits estimated in the United States. Such quantities, if realised, could have a huge impact on an economy that has always been a big oil and gas importer. However, Deal cited other studies that estimated reserves at less than 10 percent of the EIA assessment. Follow Fin24 on Twitter, Facebook, Google+ and Pinterest. JOHANNESBURG, July 22 (Reuters) – A South African anti-fracking group threatened a legal challenge on Tuesday to government plans to grant shale gas exploration licences in the pristine semi-desert of the Karoo, saying the regulatory process had been marked by “patent ineptitude”. In a February State of the Nation address, President Jacob Zuma described shale gas as a “game changer” for the economy and said Pretoria would allow hydraulic fracturing, or fracking, “within the framework of our good environmental laws”.